Candidates for the District 2 City Council seat, primarily Sarah Boot and Lorie Zapf, confronted the major issue in Clairemont these days, high-rise buildings along the east-side of I-5 at a candidate forum on Thursday, May1st. The big issue: a proposal to remove a 30-foot building height limit that currently exists along the west side of Clairemont and Bay Park. The U-T San Diego reported that around 200 people attended a candidate forum in Clairemont hosted by the Clairemont Town Council and moderated by Janet Poutré, who publishes the Clairemont Community News, where this was the main issue. The height limit removal that was proposed would go up in neighborhoods east of Interstate 5, where MTS is planning a new trolley line along Morena Boulevard, just west east of the freeway. It will run up to UCSD eventually by 2018. And part of the plan is tob uild high-rises along the transit corridor. Up to 6 story buildings were envisioned – as a way to offset the funds spent on the new trolley line. In a memo Wednesday [April 30], Planning Director Bill Fulton told Mayor Kevin Faulconer and two City Council members his department would alter its plans for the area around the planned station, which is part of a $1.7 billion project to extend the trolley from Old Town to La Jolla. The planning department won’t try to increase the limit on building height in that area, the memo said, will reconsider increasing density there and won’t reduce parking between Napier and Littlefield streets. “Fast forward a week later, and she changed her position,” said Boot, contending Zapf’s support for taller buildings might be connected to campaign donations she’s taken from developers and real estate interests. Zapf didn’t dispute she’s changed her position, but stressed that she never voted in favor of raising the height limit. Zapf said she’s now firmly against any changes. On other issues, Boot zinged Zafp for being on a City Council that has neglected the city’s neighborhoods and their infrastructure, while focusing on downtown. She pointed to the deterioration of the San Diego Police Department as an example. Zapf touted her “success” at supporting “managed competition” – where private companies are allowed to bid on municipal work. The libertarian candidate, Mark Schwartz, was also present and wanted to give voters a third choice. The Primary election the candidates are running for is June 3rd. In the past, Boot has complained that the mainstream media are ignoring the campaign between her and Zapf. The report from the U-T is the first reporting of any of the debates the two have engaged in. 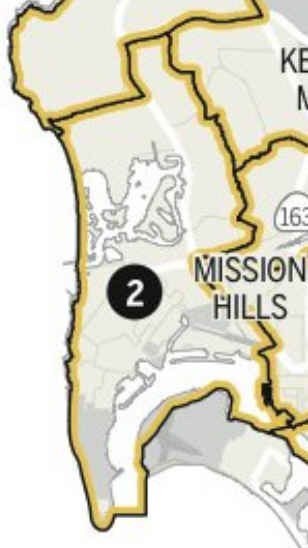 Ocean Beach, Point Loma, the Midway, Mission Beach and most of PB – plus neighborhoods of Clairemont – are all within District 2. Which council member or candidate said “density belonged in blighted neighborhoods in District 4, instead of Clairemont’s “family oriented community.” ? Sad to say, but low density development around rail stations is a perfect recipe for low ridership. Tall buildings near trolley stations are absolutely necessary to reduce use of autos. People living near the new trolley stops will be able to get to downtown and UCSD without driving, taking tons of cars off the road. It will also allow working class people who can’t afford a car to get to their jobs. It is selfish to take the big property value boost of being walking distance to a trolley line and then be against allowing more than a few people to live there. We have to cut auto use so much in San Diego, and that means having a few neighborhoods with mass transit and something other than a suburban feel. The area east of the 5 near the new troll stops is a very obvious place to do this. I am sorry to see Sarah Boot pandering like this when she is supposed to be the Democrat in the race. Go NIMBYs! Boo to the high density anti auto “smart” growth advocates. Let’s speed up traffic and add parking spots so vehicles don’t spew pollution and waste gas idling or driving in circles. … and that is why SD will always lag other large US cities. Our citizens are pathetic and against GOOD change. It’s good that San Diegans want to protect their limited height limits. We can support mass transit AND height limits. Don’t be an idiot. There’s nothing about tall buildings to support. I’m not being an idiot, Frank. I’m being realistic. It’s clear from your posts that you only see things in black and white. I take things one issue at a time. I don’t support a raising of the height limit in our beach communities, but I don’t think it’s as necessary East of the 5. There ARE things about tall building to support. The city should just skip the Clairemont stop if they don’t want to add density to their neighborhood at all. They clearly love their cars anyway, so why do they need a stop? If they enjoy looking at that blighted area that is Morena, I guess more power to them. Besides San Diego, everywhere else I’ve lived has had some sort of rail transit, whether above or below ground. I’ve yet to see a stop that worked in a low density area. The only area I’ve ever see that work is in the suburbs of Long Island, where the trains were build long ago before these debates could be had. The Voice ran a great article about comparing the transit in DC and how they got citizens to agree to the red line. That’s actually right where I grew up, just minute or two from the Bethesda station, a city where you’d think NIMBYs would be in heavy opposition. That assumption would be wrong. We all saw the benefit of having mass transit come right to our neighborhood in a city were traffic was and is becoming more hectic with each passing day. Certain things changed. Our downtown became more dense. Some taller buildings were built. But you know what? Our neighborhoods just outside the downtown didn’t change at all. The character is still the same as it was 50 years ago. In fact, the only major change was that property values went UP because it became such a hip area to live in, while keeping the quiet feel within the older neighborhoods. There was suddenly vibrant culture within our small city. Tons of restaurants and young professionals moving into the newly build condos. And guess what? Tax money came pouring in. There was plenty of extra cash from these added citizens to pay for just about every public works project we needed. I’m not saying they need to raise the height limit to 60-100 feet in Bay-Ho and Clairemont. But to condemn the project to complete failure because of some old folks refuse to allow growth is nothing but selfish. Belittling a 23 year old local for getting up at the meeting and saying she was in favor? Pathetic. No other way to say it. Rather than running back with his tale between his legs, Fulton should have tried to continue to the debate with Clairemont and tried to reach common ground. I don’t see how anyone living around there can be satisfied with what the Morena area looks like. It’s gross, old and has SO much potential. They shouldn’t give up on density altogether. There are still was to up density within a 30 foot height limit. Okay, Tyler, you have expressed your views very well (even though I disagree), but comparing DC with San Diego really is not “realistic” dude. I’ve been to Bethesda and it’s a very middle class community. There’s hardly any highrises. Again, mass transit is good (it’s about time) but to force the people of Clairemont to change their neighborhoods all for a trolley line is not being realistic. If you think Morena is ugly, go do some community organizing there and get the citizens to make it more attractive – which can be done without highrise. I don’t understand your fondness for tall buildings. They are very alienating, block views, air, sunlight – so, keep them downtown. Neighborhoods should be walkable, bikeable, pleasant areas where humans feel welcome, not overshadowed by looming structures. I’ve spent some time in Bethesda and have friends who live there. I would not call it middle class. Upper middle class at a stretch, but really it is an upper class area. The median household income there is about $120,000. It’s full of NIH, and Walter Reed employees, DC diplomats and politicians, software designers. It has to be one of the richest and most educated cities in America. I agree with the part about there being no high rises around the NIH station on the Red Line though. It’s all old stone homes with ivy growing on them. They seem to be able to support a metro stop very well without high rises. I’m not talking about the NIH stop (which has it’s own stop for obvious reasons). I’m talking about the downtown Bethesda stop. It is surrounded by tall buildings. Not sure the last time you were there… A lot of growth specifically in the last decade. The Bethesda stop is just one of many though along the red line. Plenty of others like Silver Spring, etc represent a more middle class environment. These areas are largely low density, but right around their transit stops the density is much higher. The populations near the stops are largely comprised of young professionals. I get that a major difference between there and here is the fact that major view corridors are at play in Clairemont and Bay-Ho. And as I said – I’m not just pounding the tall building side of the issue. I don’t see why they can’t build up density around Morena without interfering with the height limit. Right. Keyword downtown. High rises belong in Bethesda’s downtown like they belong in San Diego’s downtown. Morena and the areas surrounding NIH areas not so much. Clairemont was designed to maximize natural views, to build high rises on Morena blocks the view for people up the hill and shades out houses within the immediate vicinity. We just successfully fought a 7-story high rise in our neighborhood that was going to go in 10 feet from the backyard of the two story places next door. Fine for density and tax dollars for the city, but the place next door would get shaded until 1pm every day and a once private back yard would then have had a few dozen patios looking in on it. In the 70s they green-lighted 22-story and 14-story buildings and they now cast an immense shadow on the surrounding backyards. There are ways to add density with going up most def. “Middle class” covers a lot of ground, but I have to agree with you here regarding Bethesda as upper-middle class. THE upper class don’t live in cities. They live on their yachts and private jets and their get-aways in Aspen, Paris and in beautiful spots of Canada. So are we talking about the .001% when you talk about THE Upper Class? Because I can assure you that there are plenty of Upper Class by standards around these parts that can’t afford to live in Aspen or Paris. And they certainly can’t afford yachts. Plenty of Upper Class live all around us, including in OB.